Coming into Monday night’s fourth round encounter at the 2014 Australian Open, Roger Federer was not the clear cut pick by the experts, but the Swiss maestro put on a flawless performance against Jo-Wilfried Tsonga, leaving the Frenchman baffled. The variety was simply too much, too unpredictable, as the 17-time grand slam champion was putting on a vintage display of all court play. Tsonga wouldn’t settle in for nearly two sets. Just about everything was going Federer’s way, from every detail of his point construction, to serve and volley tactics. He was even correct on challenges. Momentarily in the third set, the Frenchman fired a ball out of Rod Laver Arena in frustration, and the next few games would awaken the offensive firepower of which he is known for. Federer handled the aggression as cool as a cucumber, attacking second serves, varying play with his slice, and opening the court with his backhand down the line. The aces wouldn’t come until later in the match, yet overall the Swiss hit seven, along with 43 winners to 21 unforced errors. Far from troubled on his serve, Federer saved the only break point he faced, and converted on 3/7 break point opportunities of his own. With another serve and volley point (34/41 for the match), he advanced to his 11th consecutive quarterfinal at the Australian Open. 6-3 7-5 6-4, in 1 hour 52 minutes. The win ties Federer with Connors’ mark of 41 grand slam quarterfinals, most in history. He will face Andy Murray next. All video below provided by official Australian Open social media. Federer Ball Kid Catch (Again). 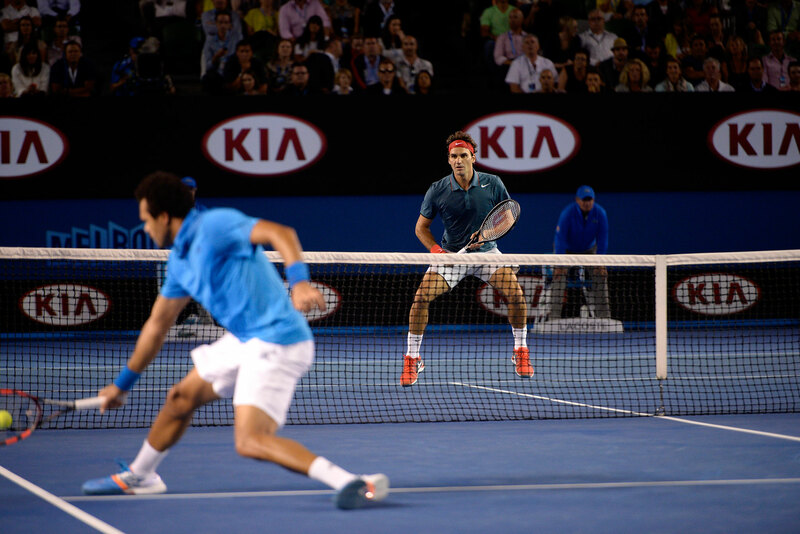 Watch full coverage of the 2014 Australian Open on FF07tv. Download the official mobile apps for iPhone, iPad, and Android.